Researchers measured the temperatures at depths beyond where seasonal shifts would affect the data. From the Arctic to the Alps to Antarctica, permafrost deep below the earth’s surface has warmed rapidly over the past decade, a sure sign that the entire planet is also warming rapidly, new research finds. Measurements from boreholes drilled into permafrost in frozen areas around the world found an average temperature increase of 0.3 degrees Celsius from 2006 to 2016, according to a study published in the journal Nature Communications. The measurements were taken in a decade-long program led by the Global Terrestrial Network for Permafrost, or GTN-P, and involving the work of scientists from 26 nations. Most of the 154 boreholes used in the study were drilled and equipped with monitoring devices during the International Polar Year of 2007-2008. Temperatures were generally measured at depths of at least 10 meters, beyond the influences of seasonal swings that would affect the surface soils. Such depths were important to understand longer-term changes, said co-author Boris Biskaborn of the Alfred Wegener Institute in Germany. “What we observed is a clear warming signal at global scale,” Biskaborn said in an email. In a statement released by the Alfred Wegener Institute, another co-author said the deep permafrost is sending an important message about the world’s changes. “The permafrost temperature is one of the most universally accepted climate variables. It offers a direct insight into how the frozen ground is reacting to climate change,” Hanne H. Christiansen, president of the International Permafrost Association, said in the statement. The warming trend was strongest in Arctic regions with at least 90 percent permafrost cover, the study found. Sites in Siberia had the most dramatic warming, with some showing temperature increases of 0.9 degrees Celsius or more over the decade. One important driver of permafrost warming in the Arctic is the loss of Arctic sea ice, said co-author Guido Grosse, head of the Permafrost research unit at the Alfred Wegener Institute’s Helmholtz Centre for Polar and Marine Research. The dramatic warming in Siberia is partly explained by the extremely cold starting point for Siberian permafrost at the beginning of the study’s decade-long measurements, said co-author Hugues Lantuit, also of the Alfred Wegener’s Centre for Polar and Marine Research. “In short, it is easier to warm up very cold permafrost than ‘warmer’ one,” Lantuit said by email. As permafrost temperatures get closer to the thaw point, he said. A large amount of heat is needed to melt ice that remains in the soil when permafrost is close to thaw temperatures, he said. Permafrost warming and thaw can have expensive and possibly dire consequences for people living atop the once-stable soils. Roads, buildings, pipelines and other important infrastructure are put at risk by thaw and slump, the authors note. In high mountain areas of Europe and Asia — the Alps, the Himalayas and the Nordic peaks, where permafrost temperatures rose an average of 0.19 degrees Celsius — warming can put the stability of glaciers and rocks at risk, the authors said. The result can be big rockfalls, Lantuit said by email. “These can be very substantial and lead to the destruction of roads, ski lifts, high altitude infrastructure, etc.,” he said by email. There are also slower-moving risks, he added. 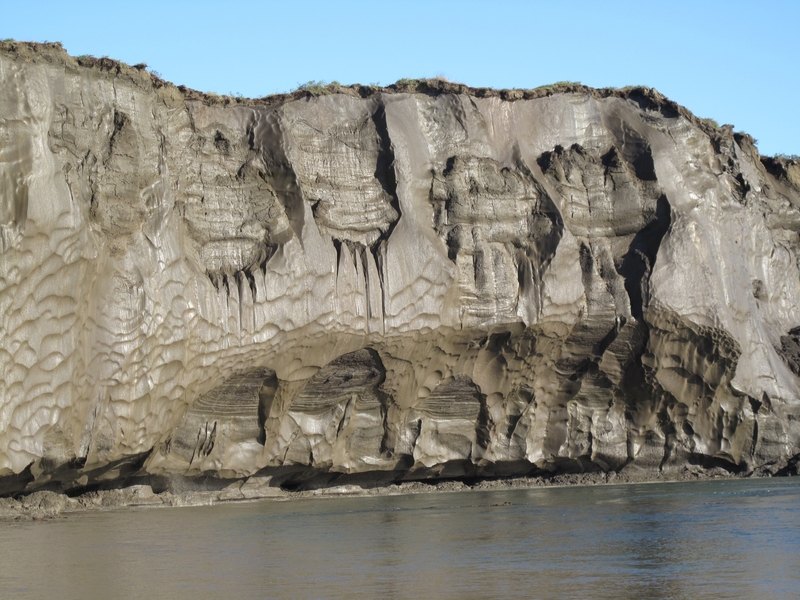 “Rock glaciers creep slowly downslope and can also impact infrastructure. In Alaska, a rock glacier is so close to the road that it is now threatening it,” he said. Aside from its local and regional effects, permafrost warming presents a global risk. The large amounts of plant and animal matter sequestered within the now-frozen soils would be degraded by microbes if that occurs. That process would pump yet more greenhouse gases into the atmosphere, potentially enhancing global warming by an additional 0.13 degrees to 0.27 degrees Celsius by the end of the century, the Alfred Wegener Institute statement said. The study found some geographic variations in temperature trends. In Arctic regions with less than 90 percent permafrost cover, the average warming over the study period was 0.2 degrees Celsius; in Antarctica, the relatively shallow boreholes showed an average warming of 0.37 degrees Celsius over the period. At some boreholes, there was no change in deep permafrost temperature, and soil temperatures dropped at a dozen of the sites, while at five of the sites, the soil became thawed over the study period. But since “permafrost warming is not a linear system,” it is very difficult to forecast the time when there will be large-scale thaw, Biskaborn said. The risk of releasing more carbon gases is enhanced across the Arctic and boreal regions by various disturbances that expose near-surface permafrost to warmer air temperatures. A separate study by some of the same co-authors and published in Nature Communications on Dec. 21 assesses those “permafrost region disturbances.” The three main types of permafrost disturbances are abrupt lake changes, either loss from drainage or expansion; wildfires, which mostly occur in boreal regions where permafrost is discontinuous; and thaw slumps, that study found.